Millions are going transcript crazy right now and wasting the IRS time that they could be processing our returns. We all need to slow down if you order your transcripts by mail the IRS says to allow them 5-10 days for processing and delivery. The IRS also has a restriction on the time period between orders and the number of times in a calendar year you can order your transcripts by mail. So in my opinion ordering them to soon could mess you up down the road in that calendar year if you may need them for something important. Mailed transcripts can be helpful for your personal records or to provide information to lending institutions, where you might be applying for a student loan or a mortgage. Tax Account Transcript – provides an overview of your account. It shows filings, extensions, withholding, credits and any follow-up transactions on your account including penalties, assessments, IRS inquiries and other account activity. Basically, if there have been any IRS actions on your account, they will appear on this transcript. You can access the current tax year and three prior tax years. Older account transcripts can appear if there has been activity within the past three years on the account. Tax Return Transcript – A tax return transcript shows most line items from your tax return (Form 1040, 1040A, or 1040EZ) as it was originally processed. Changes made to the return after it was processed are not reflected, including any amended returns filed. If you need a copy of your tax return for any reason, such as a loan or financial aid application, this is the transcript to use. You can access the current tax year and three prior tax years. If you do not see a return transcript available for download, it likely means that no return was filed for that year, or that the IRS has not processed the return. TO BE ABLE TO DECIPHER YOUR TAX ACCOUNT YOU WILL NEED TO VIEW THEM ONLINE ONLY. IF YOU DO NOT HAVE THE RESOURCES TO CREATE AN SECURE ONLINE ACCOUNT WITH THE IRS AND VIEW THEM IN REAL TIME. THEN HONESTLY YOU DO NOT NEED YOUR TRANSCRIPTS. REMEMBER NEVER ORDER BY MAIL ONLY VIEW THE PDF ONLINE IF YOU WANT REAL TIME UPDATES! WHEN I SUBMITTED THE ONLINE FORM THE IRS SAID THE TAX TRANSCRIPTS WAS UNAVAILABLE. WHAT SHOULD I DO? There is a processing delay between when taxes are filed and when the tax transcripts can be ordered. Review the statements below to ensure you have waited the appropriate length of time and that you do not owe taxes. If none of the below conditions apply to you, you will need to call the IRS to request the transcript and/or troubleshoot. Electronic tax return submissions could take up to 2 weeks before they are available to request a tax transcript. Paper tax return submissions take about 6-8 weeks. If you owe money to the IRS (not due a refund), there is a known processing delay by the IRS. Pay your tax liability as soon as possible and then request a tax transcript. The IRS has indicated that tax returns for tax filers that owe a balance will not have a transcript available until May or later. Verify you have entered the information correctly on the online form. WHAT HAPPENS WHEN REQUESTING TRANSCRIPT IT SAYS MY ADDRESS DOES NOT MATCH? WHY DON’T MY TAX TRANSCRIPTS REFLECT THE RETURN I JUST FILED? The most recently filed tax return isn’t reflected on your transcripts yet because the IRS has not begun processing the return. Your return should post to your account transcript within about one week of the IRS accepting it. The return transcript takes longer for the IRS to post to your account. 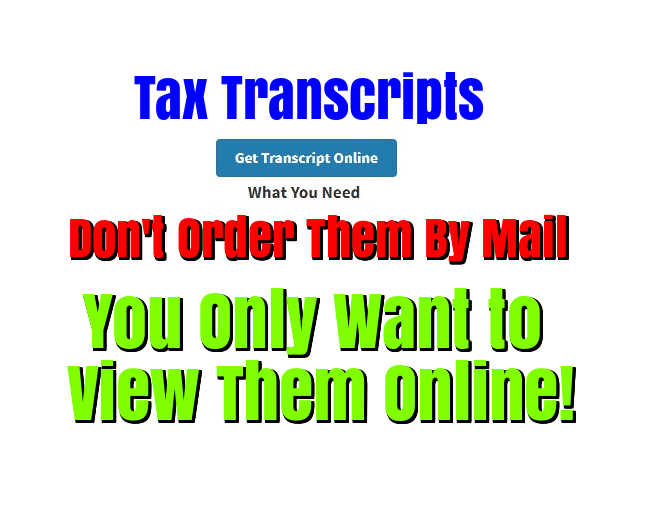 I CHECKED IRS “GET TRANSCRIPTS” AND I CAN ORDER BOTHTRANSCRIPTS IS THIS GOOD? This is a good sign but if you can not view them online in real time they are not going to help you out. You need to follow the transaction codes listed on the account transcript for the progress made on your return and be watching for an 846 Refund Issued Code. When you order them by mail you will wait 5-7 days and by the time the transcripts arrive at your mailbox updates may have occurred on your account. Ordering transcripts by mail will do nothing at all in helping you figure anything out with your tax return. IF I ORDER MY TRANSCRIPTS BEFORE THE IRS BEGINS PROCESSING MY RETURN WILL THEY ARRIVE BY MAIL BLANK OR WITH ALL ZERO’S? Yes, there is a good chance they will be blank because the tax return has not begun processing. This is where being able to view your transcripts online is a MUST. If you order them by mail before the IRS begins processing your tax return you will end up with an incomplete transcript. And millions of people follow this trend and it ends up wasting a lot of peoples time and money if they arrive blank. This is why we STRESS you must view them in PDF form online to get real-time updates. If you have a secure online access you can log in and check them as often as you WANT. HOW DO YOU FIND OUT WHEN TRANSCRIPTS UPDATE? Daily Accounts have Tuesday Transcript Updates and Weekly Accounts have a Friday Transcript Updates. You can view our IRS update calenders here and they will show you what days transcripts update for taxpayers. I AM THE VICTIM OF IDENTITY THEFT AND CANNOT OBTAIN A COPY OF MY TRANSCRIPT. WHAT SHOULD I DO? Victims of identity theft who cannot get a return transcript or use the IRS Data Retrieval Tool must call the IRS’s Identity Protection Specialized Unit (IPSU) toll-free number at 800-908-4490. After the IPSU authenticates the tax filer’s identity, you can ask the IRS to mail you an alternate paper tax return transcript known as the TRDBV (Transcript DataBase View) that will look different than a regular transcript but that is official and can be used for verification. In addition, the Transcript DataBase View, victims of identity theft must self-certify that they are the victim of identity theft and that they have notified the IRS. Please feel free to stop by our transcript resources page to help you decipher your transcripts! If you have questions related to your transcripts feel free to share them below. And REMEMBER NEVER ORDER BY MAIL ONLY VIEW THE PDF ONLINE IF YOU WANT REAL TIME UPDATES!